14 count Perforated Paper for cross stitch or embroidery with 14 holes per inch. 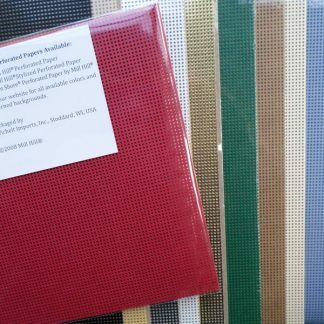 Two sheets per pack 15 x 23 cm (6 x 9″) each. It doesn’t tear while you are stitching but is very easy to cut with scissors or a craft knife. Flexible and no hoop needed. Great for stitching designs, holiday ornaments & decorations, gift tags, wedding and birth announcements, book marks, door knob hangers etc.